Because of its portability and intuitive interface, the iPad has been adopted by customers and agents in the real estate marketplace. Real estate professionals have always looked for ways to deliver attractive and informative methods of marketing properties, without requiring time and complexity in their creation. 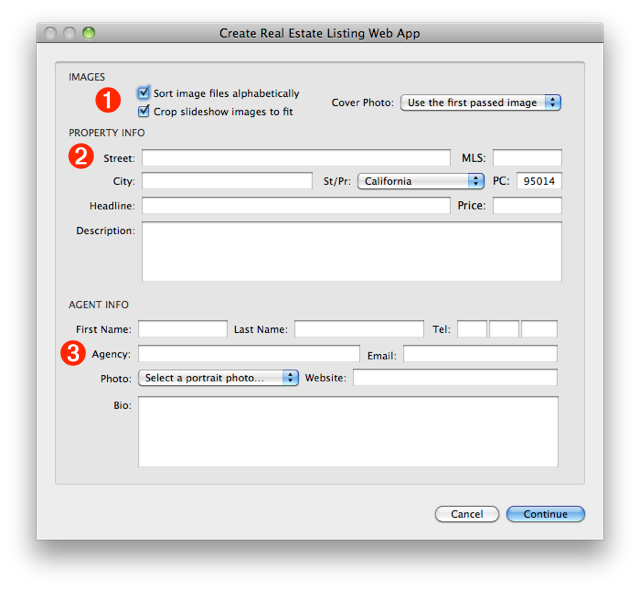 The Create Real Estate Listing Web App Automator service quickly turns a selection of images and information into an interactive web application designed for the iPad. Simply select the images to use, run the service, provide property and agent information in the service interface, and the web bundle is automatically generated for you. Input - Options for determining how the images passed to this action are processed. Options include: determining the order of the images in the slideshow by sorting them alphabetically by name; indicating whether images should retain their current proportions or be cropped to fit in the 4 x 3 view; and for choosing the image to use as the background of the cover page. Property Info - Enter the information for the listed property. Includes the MLS (Multiple Listing Service) number, which is only used in correspondence with the agent. Keep the description limited to the space provided in the input field. Agent Info - When the agent button is tapped on the navigation bar, a screen containing the agent biography and contact information is displayed. Tapping the mail icon at the bottom right of the agent image will open a new mail message addressed to the agent. Included with the Automator action are two Mac OS X services, one for image files selected in the Finder, and the second for image versions selected in Aperture. To create a Real Estate Listing web-app bundle using image files, select the property image files in the Finder that you want to use in the slideshow, and select Create Real Estate Listing Web App from the Finder's action menu or contextual menu. In the forthcoming dialog, enter the property and agent information. Once the service has created the web-app bundle on the desktop, it will open it in Safari for you to review. To create a Real Estate Listing web-app bundle using Aperture images, select the property image versions in Aperture that you want to use in the slideshow, and then select Create Real Estate Listing Web App from the Application > Services menu. To share the web-app with others, rename the web-app bundle created on the desktop, and copy it to a web-server. Click here for instructions on how to automate the process of sharing the web-app using your MobileMe account. The Real Estate web-app is designed to be viewed full-screen on the iPad. Click here for instructions on how to enable full-screen viewing. You can download the installers for the actions and services here. 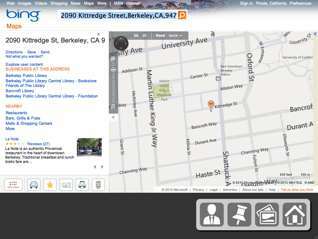 An example of a Real Estate listing web-app. Mention of third-party websites and products is for informational purposes only and constitutes neither an endorsement nor a recommendation. PADILICIOUS.COM assumes no responsibility with regard to the selection, performance or use of information or products found at third-party websites. PADILICIOUS.COM provides this only as a convenience to our users. PADILICIOUS.COM has not tested the information found on these sites and makes no representations regarding its accuracy or reliability. There are risks inherent in the use of any information or products found on the Internet, and PADILICIOUS.COM assumes no responsibility in this regard. Please understand that a third-party site is independent from PADILICIOUS.COM and that PADILICIOUS.COM has no control over the content on that website. Please contact the vendor for additional information.